Preheat oven to 300F. Spread pepita seeds in a single layer on a baking sheet. 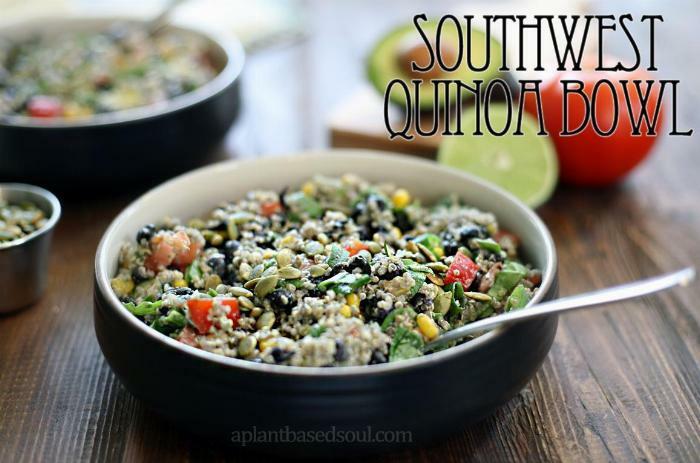 Place quinoa in a pot and cover with water. Soak for 10 minutes and then drain. Cover with water again and place on the stove over medium heat. Stir frequently and cook until tender, about 10-12 minutes. While the quinoa is cooking, chop all vegetables and add to a large bowl. Stir in avocado, corn, quinoa, and bla. . .
1Preheat oven to 300F. Spread pepita seeds in a single layer on a baking sheet. 2Place quinoa in a pot and cover with water. Soak for 10 minutes and then drain. Cover with water again and place on the stove over medium heat. Stir frequently and cook until tender, about 10-12 minutes. 3While the quinoa is cooking, chop all vegetables and add to a large bowl. Stir in avocado, corn, quinoa, and black beans. 4Prepare dressing by placing all ingredients in a high powered blender. Blend on high until smooth and creamy, about 1 minute. 5Drizzle the dressing over the quinoa mixture and stir to combine. Place in the fridge to cool. 6Place the pepita seeds in the oven for 5-7 minutes or until crispy. Sprinkle over the quinoa mixture with cilantro if desired. 7Serve at room temperature or chilled.